The Motorola MILESTONE 2 box includes the standard set of goodies – a charger, a one-piece headset and a microUSB cable. I also found a travel adapter in the box as the charger was of the UK variety. There’s also an 8GB microSD card preinstalled (just like the original), but the MILESTONE 2 comes with 8GB of built-in memory too, for a total of 16GB out of the box. I’ll leave the details for the review, but here are the major selling points of the Motorola MILESTONE 2. 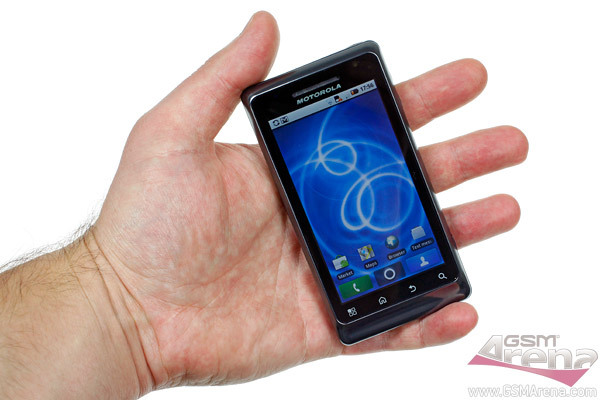 The Gorilla Glass protected screen is a 3.7” unit with 480×854 pixels resolution. Sliding it open reveals a four-row QWERTY keyboard. The slider is not spring assisted and not very easy to use – the keyboard at least looks comfy, but I’ll have to spend more time using it to pass a final judgement. The OS is Android 2.2 Froyo running on a 1GHz CPU. It’s augmented by the MOTOBLUR UI version 1.5 – as expected, there’s SNS integration all around, but some other handy tools as well. There’s a Task manager preinstalled and there is also the Profiles setting, which is similar to Sense UI’s Scenes. Flash and Wi-Fi hotspot functionality are included too. Oh, and there’s one more update – the 720p HD video recording. There’s a lot more to cover, but that will have to wait for the review.